While at the containment center in Savelugu, Ghana, Sadia Mesuna and Fatawu Yakubu look at book about Guinea worm disease. Sadia learned that "you get Guinea worm from the water. If you drink it unfiltered, you get Guinea worm." Credit: The Carter Center/L. 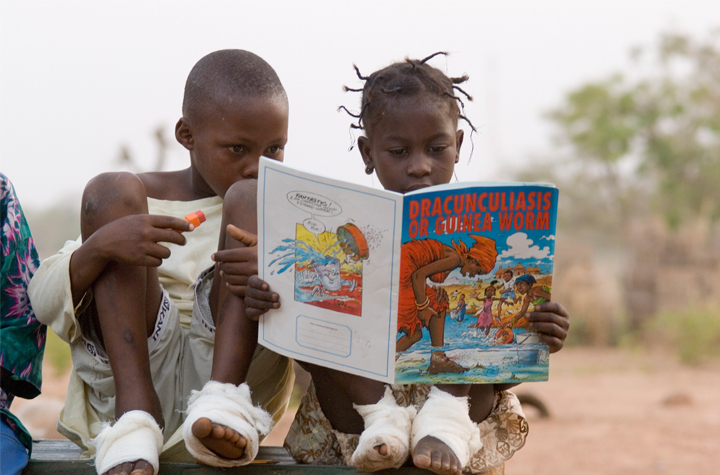 Gubb, “GUINEA WORM REVIEW,” The Global Health Chronicles, accessed April 20, 2019, https://globalhealthchronicles.org/items/show/4925.